Noel Cuevas celebrates his huge home run. Credit: Joe Nicholson, USA TODAY Sports. Rubber match in the Emerald City. Denver native Kyle Freeland and James Paxton put on a show in Seattle for most of Saturday afternoon, limiting the Rockies and Mariners offensively in the Rockies 5-1 win. Freeland was solid — working out of multiple jams — and Paxton was even better for most of the game. Though, Colorado scored first in the contest, and last. In the fourth inning, Ian Desmond singled, stole second base and was hit home by Carlos Gonzalez for the 1-0 lead. And in the seventh, Noel Cuevas’ three-run bomb sealed the deal for Colorado. In the bottom half of the first, Seattle had runners on the corners with only one out, but Freeland struck out John Andreoli and got David Freitas to pop up. He didn’t have his best stuff on Saturday, but Freeland’s resolve helped him go unscathed in terms of runs allowed for four innings. But in the fifth, Seattle finally struck pay dirt; Jean Segura homered to left field to tie the game up at 1-1 through five. Freeland went 5.0 innings pitched, giving up five hits, one run and struck out four while walking four. 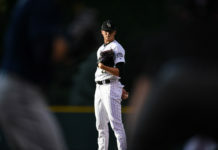 Scott Oberg entered the game in the bottom of the sixth, and went 1-2-3. Meanwhile, Paxton was in cruise control until the seventh inning, walking his first batter in Pat Valaika, and then giving up a single to Gerardo Parra. 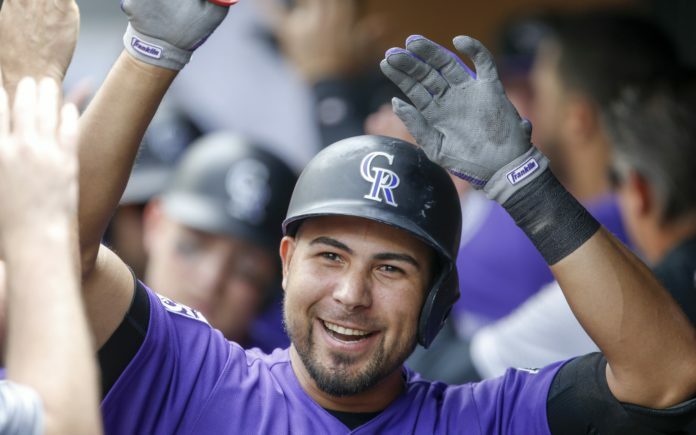 That set up Cuevas, who stepped in and smacked his second home run of the season out into left field, a three-run jack to give the Rockies a 4-1 lead. Paxton finished pitching 7.0 innings, giving up seven hits, four runs and striking out nine batters. Adam Ottavino then came in for Colorado in the seventh, striking out three while giving up a single. Ottavino worked the eighth inning, too; he gave up another single but the Rockies turned a double play to end that inning scoreless. 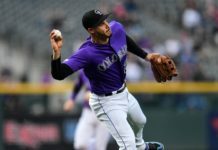 In the top of the ninth, the Rockies padded their lead when Gonzalez doubled, Valiaka singled and Parra hit a sacrifice fly to score CarGo for the 5-1 lead. Wade Davis came in for the save. Colorado improved to 46-43 with the win, their fifth straight victory overall and eighth in nine games. The Rockies are on fire, and they’re closing on the Arizona Diamondbacks, now only three games back in the NL West. Tomorrow, the Rockies and Mariners face off at 2:10 p.m. MT once again, with Colorado looking for the sweep against a magnificent Mariners squad. For Cuevas, the three RBI were a career-high in a single game. Charlie Blackmon’s four strikeouts were also a career-high, per Rockies PR. It was the first home series Seattle (56-34) lost since late May.